For over four billion years the Earth's bacteria colonies, plants, marine life, animals and even the rocks, created and maintained an environment conducive to life. The Earth behaves like a living being, which alters its environment, an entity called Gaia. Today, biodiversity loss and a growing human population has stressed Gaia to her breaking point. Climate change is one of her defence mechanisms. How can we best co-operate with Gaia in this time of crisis? 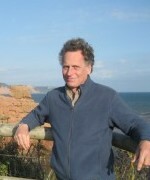 Paul Kieniewicz is an astronomer, geologist and author, speaks several languages, talks occasionally on astronomy, geology, and the Gaia Theory. He lives near Glass on three acres, which he is transforming into a diverse garden. He is the author of Gaia's Children, a story of post-apocalyptic Aberdeenshire, and Immortality Machine.